The Centro Vicente Canada Blanch at 137 Portobello Road, London W I I is a school offering full bilingual education for children from the ages of 6 to 18. It is fully funded by the Spanish Government. The initial purchase of the school building, originally a convent was funded by the Vicente Canada Blanch foundation, a charitable foundation set up to promote educational links between Spain and Britain. The school occupies a large triangular plot at the northern end of Portobello Road. The playground is surrounded by Victorian terraces and the school block and is unique because of its considerable size and its mature trees within this tight knit urban context. The building has no large indoor spaces and the brief for the project was to create a covered area in the existing playground which could be used as a “5 a side” football pitch and as an assembly point during rain interrupted breaks. The project was funded by the Vicente Cañada Blanch Foundation. 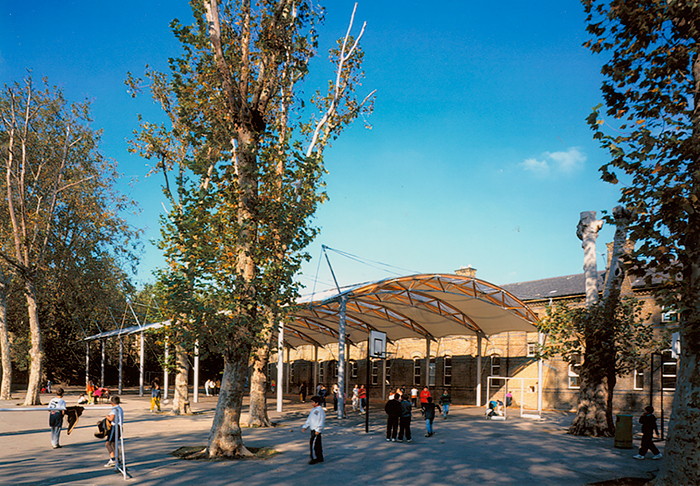 The design aimed to insert a large span structure within the existing trees which would be sympathetic to its surroundings and soften the rear of a dour, institutional Victorian block. The galvanized steel column support trusses which are composed of American Southern Pine members with purpose-cast aluminium nodes. The steel roof trusses are connected to the columns by cast steel heads from which spring the mast and tail used for post tensioning. Between the trusses stretches a tensioned fabric roof. The trusses are covered in clear polycarbonate. 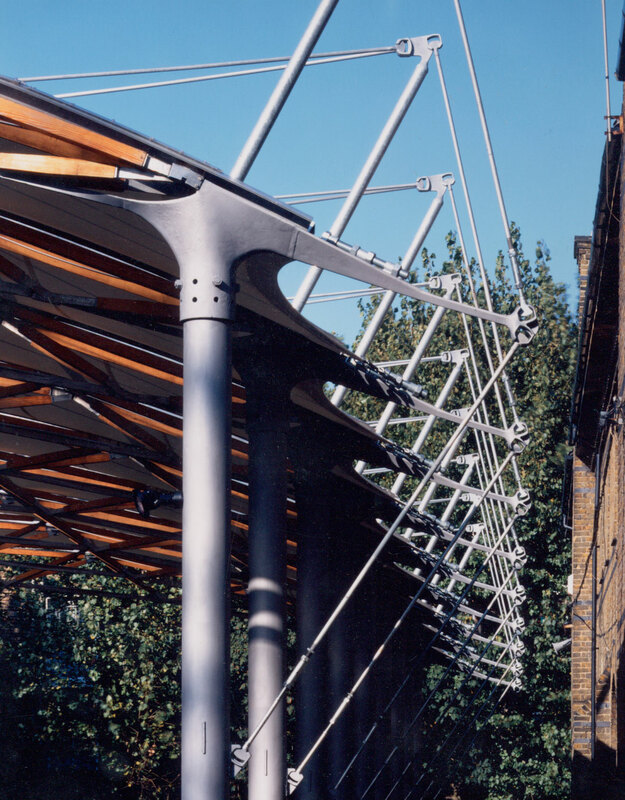 The timber and cast aluminium truss aims to introduce a visually softer, warmer material, responsive to the brick school building and its surroundings, which along with the columns echo the trees amongst which they are inserted. The rhythm of the overall structure follows that of the Victorian terraces which back on to the playground, and echoes Victorian train stations. The translucent fabric roof, punctuated by the sky visible through the trusses aims to create a light and transparent structure in contrast to the surrounding austerity.